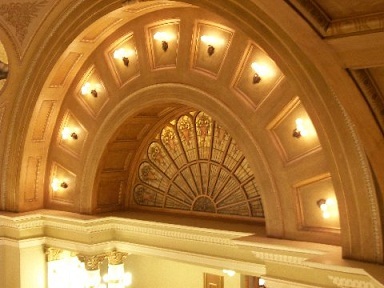 Visiting South Dakota’s Capitol building is like going on a treasure hunt. People search for sky blue tiles in the terrazzo tile floors. Almost all the marble tiles in the Capitol’s floors are yellow, rust, white, black, tan and green – almost, because 66 of them are said to be blue. The story goes that each of the 66 Italian workers who laid the floor during the Capitol’s 1905-1910 construction was given a blue stone to place anywhere in the Capitol as a “signature stone.” To date, 57 of the tiles have been found. It’s a story that causes visitors to the Capitol to look for the special tiles, and it might be just that – a story. Interviews with men who helped construct the building say nothing about Italian craftsmen working on it, and people looking at records say they can find no evidence of the craftsmen having stayed in Pierre. The blue tiles are not the only point of interest in the Capitol. Incidentally, South Dakota’s statehouse is not the only one with an inverted spindle. According to Richard R. Gibson’s A Celebration of State Capitols, a lone spindle in the Wyoming Capitol is upside down. The staircase was built by Amish craftsmen, who placed it upside down to remind all who pass by it that no person or law is perfect. The stately columns inside the Capitol appear to be marble. They were constructed in scagliola. First, the columns were created from plaster and covered by marble dust, ink and yarn. Once the mixture hardened, it was polished to a lustrous sheen that resembled marble. The resulting columns cost $100 each, whereas marble columns would have cost up to $1,000 each. Some of the Capitol’s stained glass windows honor the first settlers in the state, according to Barbara Johnson of Aberdeen. She is a South Dakota Humanities Council scholar who has researched for the past five years the role stained glass plays in buildings and how stained glass reflects culture and history. To Johnson, the fan-shaped stained glass panel in the back of the House chamber and the stained glass panel dedicated to Gov. George S. Mickelson and seven other men who were killed in a plane crash have motifs that resemble wingless water striders. Johnson contends that the water strider’s large eyes correspond to two large circles in each motif, while the insect’s front, middle and hind legs match up with the swirls in the motif. The water strider was called a straddlebug by pioneers who often saw it skittering across the surface of the state’s lakes and ponds. A straddlebug was also three boards set together in tripod form and used by homesteaders to show that a claim was occupied. One more thing that those visiting the Capitol might not realize is that the Capitol Hill area was the “Boot Hill” cemetery of early-day Pierre. During the final grading and landscaping around the Capitol, workers unearthed a number of pine coffins. A worker recognized one of the skeletons as belonging to Arkansaw, a desperado shot to death by vigilantes at the foot of Pierre Street in Pierre in 1881.